THP 4-10-001 ELD (Quiver THP) Sierra Pacific Industries, 722 acres, 34% clearcut, 14% sanitation-salvage, 30% shelterwood logging. Peavine Creek, Silver Creek (MD: T11N R14E Sec.2, 3, 10, 11, 12, 13, 14; T11N R15E Sec.7, 18). Winter operations, moderate erosion hazard, steep slopes up to 50%, scattered large trees, sierra nevada red fox sighting, 3 spotted owl territories, stebbins phacelia rare plant. Estimated public comment deadline: 2/19/10. 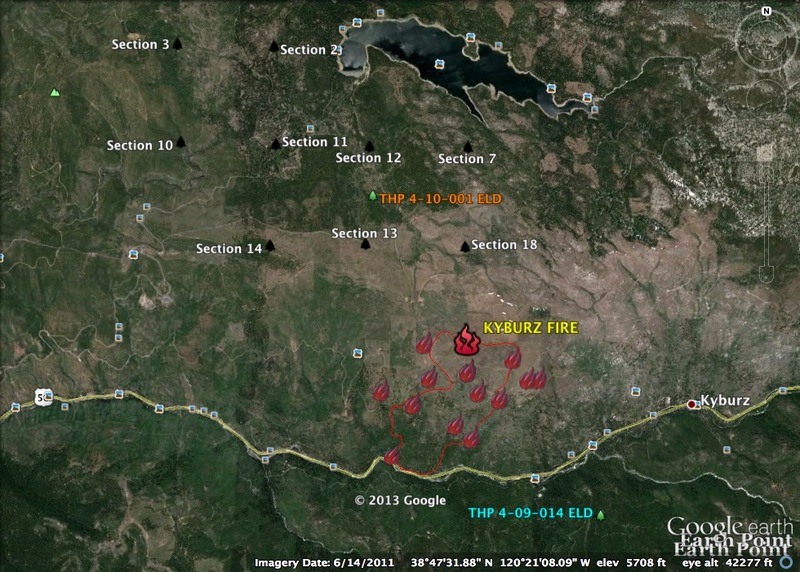 The Kyburz Fire began on July 8 near Highway 50 at Mile Post 29 west of Kyburz, CA. The fire is currently burning in timber and brush near Sierra Pacific Industries THP 4-10-001 ELD (Quiver THP). 07/12/13: The fire has been reported as 100% contained, and CHP is reporting the fire originated from sparks created when a vehicle blew a tire on Highway 50.